Winner at the The World’s Original Marmalade Awards. 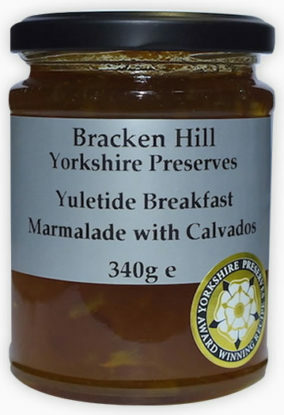 What could be better on Christmas morning (or any morning) than a luxurious English marmalade made with Calvados. First bought at York food fair in 2015 and have been buying ever since. Best marmalade ever! Don’t change the recipe. Sugar 64%, Oranges 40%, Lemon Juice (From Concentrate), Calvados 2%, Gelling Agent: Fruit Pectin, Citric Acid, (Prepared with 43g Fruit per 100g. Total sugar content 69g per 100g).